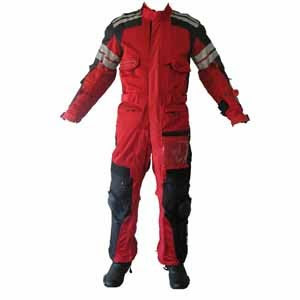 Teiz is new seller of motorcycle gear in the U.S. market and is attracting attention with its prices -- mesh suits from $219 and textile suits from $319! I've never seen a Teiz product (they're only available online direct from Teiz at present), but judging by the photographs I've seen and webBikeWorld's review, Teiz (pronounced similar to "taze" and means "fast" in Urdu) has a long way to go before it can measure up to the likes of Aerostich, Rukka, or even Rev'It! Seems to me Teiz is concentrating more on loading-down its products with features (of which there are scads) when it should concentrate more on basic construction and materials. However, Teiz is going about its product development the right way -- in consultation with its intended customers. The owner, Ghazi, seems to be very responsive to feedback, and keeps running conversations here on Sport-Touring.Net and here on ADVrider.com, in addition to Teiz's Facebook and Twitter presence. If Ghazi can survive the tough ADVrider critics, his company may do OK. For me, it's difficult to justify taking a chance on a Teiz jacket or suit when the same money buys a second-hand, tried-and-true Aerostich. But I'm watching.